Every Great Passion Has Consequences. 20 years ago it was a Love That Dare Not Speak Its Name. Well actually, it was a Love They Just Couldn't Shut Up About. You know, love between a human and a member of the Differentially Animated Community. Love between humans and WereWolves, Vampires, and all kinds of angels and devils from mythologies and religions from every part of this polytheistic universe of ours. In this particular instance, love between a regular guy and a WereLion. Great passion causing canyons to appear, mountains to form, glaciers to melt, continents to move, planets to change orbit. But 20 years later, the local geomorphology has remained unchanged for a long time. He has a job. She has a house. They have a kid, Kitty, 13 years old. Soccer. Shopping. Sports on TV. Then one day, he disappears, caught in a trap (his car) that he cannot get out of. Now it's time for a lioness to find her mate, and to begin to teach her daughter what being a WereLion is all about. 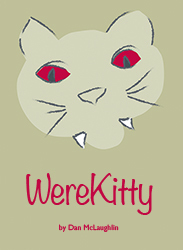 It's time for the WereKitty to begin to grow up. And time for you to buy a copy of it for less than $10 at amazon. Here is the first 17 pages of the book where we meet Leona, the WereLioness, shopping; Fred, the regular guy, driving, and Kitty, their daughter, being 13, for free. Here is the scene where Leona, the WereLioness, her daughter Kitty and her sister Karen visit Rex, Leona's boyfriend from summer camp, for free.